RECENTLY ENTERED: Crime, sorry, wine writing doesn’t pay. I am auctioning my case of 12 bottles of 1978 CHÂTEAUNEUF-DU-PAPE DOMAINE DU VIEUX TÉLÉGRAPHE RED courtesy of Zachys Asia in Hong Kong on 16 January 2014. This has been with me for almost 35 years, therefore, but needs must. I last drank this wonderful wine with DANIEL BRUNIER at VIEUX TÉLÉGRAPHE a year ago, and the story behind it and its little cousin 1985 is told under VETERANS CORNER. Of more recent hatching is 2012 CÔTE-RÔTIE. A full report on the vintage has been entered under 2012 NORTHERN RHÔNE, subtab THE LEADING WINES. Over 75 wines have been tasted, and the leading ones named. The current, revised status of the high, high quality DOMAINE JAMET, where the two brothers have gone their separate ways, is also covered. DOMAINE VISITS: domaine visits were postponed until November this autumn due to late harvesting. News, quotes and tasting of wines have been posted from, at CONDRIEU, YVES GANGLOFF and DOMAINE GEORGES VERNAY. RECENTLY ENTERED: a cluster of 2012 CÔTE-RÔTIEs, from a vintage lining up as more promising and interesting than the 2011. Visits were made in November, with a raft of tasting on a wide range of wines. The fruit is clear, the structure fresh. Among those noted are GILLES BARGE, MARYLINE & CHRISTOPHE BILLON, DOMAINE DE BONSERINE, BERNARD BURGAUD, M.CHAPOUTIER, CLUSEL-ROCH, DELAS, DOMAINE FAURY, PIERRE GAILLARD, DOMAINE GARON, PATRICK JASMIN, STÉPHANE PICHAT, DOMAINE DE ROSIERS, RENÉ ROSTAING, FRANÇOIS VILLARD. The very good line-up of 2012 JULIEN PILON Northern Rhône whites has also been entered. He is listed under SAINT-JOSEPH. From CONDRIEU, the ANDRÉ PERRET 2012s have been tasted, with a good leaning towards w.o.w. qualities. The 2011s and 2012s of two of the best domaines in the VENTOUX have also been marked up: CHÂTEAU PESQUIÉ and DOMAINE DE FONDRÈCHE. The whites of both are well made – another example of the great strides made in Rhône whites. The reds have robust, clear flavours, more modern and racy than traditional. One vintage of CHÂTEAU-GRILLET, the 2009, has been tasted as well. Questions burn over whether the Bordeaux school understands the VIOGNIER well enough to make true Rhône whites from this variety. I suspect they are trigger happy on the harvesting, and risk averse. There is presumably a market for these metropolitan wines, as has been noted with PAUL JABOULET AÎNÉ under its new owners. For those who like proper local stamp and depth in their Rhônes, well, you can always pass, especially at their very high prices. beyond the dizzy heights of CHÂTEAU DE BEAUCASTEL at CHÂTEAUNEUF-DU-PAPE, two STGT domaines have been visited, their recent vintages up to 2012 tasted with pleasure. Both operate whole bunch fermentation and are hands-off in their cellar approach. YANNICK FÉRAUD, the 27-year old son of EDDIE, is now in full swing at the family property. EDDIE is the nephew of PAUL FÉRAUD of DOMAINE DU PEGAÜ. I have always appreciated the simplicity of presentation of these wines, hence their STGT appeal. The cellar takes one straight into the close ambience and intimacy of a northern Rhône vigneron, where detail rather than broad brush strokes applies more than ever. Nearer the end than the start of his career is RÉGIS BARROT of DOMAINE LUCIEN BARROT et FILS. Here is another STGT grower who now spends about half his year in the Philippines, in the south, near the beach. What a wise man. RÉGIS’ first vintage was 1971 and he remarked that 2013 was a late year, but not as last as some of his 1970s vintages, when harvesting would be taking place around 11 October. Like the 2010 of EDDIE FÉRAUD, I have upgraded his 2010, a vintage that is really starting to show its wonderful, enduring qualities, the best for years. Also visited at CHÂTEAUNEUF-DU-PAPE, their full range tasted, among which the CÔTES DU RHÔNE VILLAGES of LAUDUN – the CHÂTEAU DE BORD - and CAIRANNE – DOMAINE GROSSET - showed well, was BROTTE, run by the simpático LAURENT BROTTE. I also highly recommended his sister's NOUGAT de MONTÉLIMAR, by the way. I find it extraordinary and optimistic that LAUDUN is actually applying to elevation to full CRU status, as is finally being achieved by CAIRANNE soon, and as was most recently done by RASTEAU. LAUDUN is a very good terroir for white wines, but there aren’t enough domaines of real ballast to make truly worthwhile. At the most basic level of observation, promotion means prices rise, and LAUDUN simply lacks the profile for that, and also a wide enough spread of good to top quality among its red wines. The Danes have a healthy thirst for Rhône wines, with steady growth in imports and awareness over the past 15 years. I have been several times to Denmark, and given tastings there, and I am always struck by the keenness of the audience to learn about the story behind the wine, and to appreciate it in a wide context. The taste is also pretty classic, with wines of clear fruit and balance appreciated, rather than a stampede for the big, overblown wines that are gradually fading from fashion. Helping this movement along for many years has been my friend NIELS LILLELUND, an old school journalist who has a food and wine column on the newspaper named after the fertile west coast region of Jutland, Jyllands-Posten. Niels is also a writer of crime novels, a book on Poker, and an arts writer. His journey to New York to encounter (the mot juste, I feel) the white suited Tom Wolfe, author of the Bonfire of the Vanities, sticks in my mind, for instance. Niels’ first book on the Rhône was published in 2004 – Rhône-vinene. This second book, VINENE fra RHÔNE is more sophisticated, more opinionated, more broad, more relaxed. Denmark is well served by such a book, since it runs with Niels’ enthusiasm as well as his sometimes quirky, pesky humour: take the subtitle to the short chapter on Grignan-les-Adhémar: “I rather like bad wine … one gets so bored with good wine”, a quotation from BENJAMIN DISRAELI, Earl of Beaconsfield and British Prime Minister in the nineteenth century. Indeed, the literary allusions are abundant and entertaining. ERNEST HEMINGWAY turns up, greeting us as we start our ride down the Rhône, with a quotation from A Moveable Feast about eating trout and drinking Sion wine as he looked at “the trees at the mouth of the Rhône where it flowed into the lake.” BOB DYLAN ("we started out on Burgundy, but soon hit the harder stuff"), MARTIN LUTHER, the fictional aristocratic English sleuth LORD PETER WIMSEY and a cast of varied characters also feature. Each appellation is covered in broad text followed by compact grower or domaine profiles. The book is liberally sprinkled with quotes from vignerons of esteem to illuminate views succinctly. There are sketches and personal reminiscences of domaines, full of examples, and the book does well to avoid tasting notes. Producers are rated from 2 stars to 6 stars (CHÂTEAU RAYAS, JEAN-LOUIS CHAVE). Clear, uncluttered maps show the eminent lieux-dits, or best sites, in the appellations, with the leading ones such as Les Bessards at Hermitage given a close-up profile. There is a handy review of the better restaurants and hotels, north and south, and the colour photographs are handsome, both winter and summer well acknowledged. While a good march around the vineyards and cellars of CHÂTEAUNEUF-DU-PAPE is provided, the text is lighter on the likes of RASTEAU, LIRAC, VINSOBRES and VACQUEYRAS. A good book, a good read, even though my Danish is very limited. It provides entertainment as well as insight. I recommend it to all my Danish subscribers and readers, if you are not already aware of its publication. RECENTLY ENTERED: a full report on the 2011 VACQUEYRAS REDS, WHITES and ROSÉS, and a full report on the 2011 LIRAC REDS, WHITES and ROSÉS. A useful vintage in both appellations, the open ease of the best red 2011s a mark of pleasure for medium-term drinking. Log In, go to side tab 2011 SOUTHERN RHÔNE and move across to the right to THE LEADING WINES. For the short-term, a selection of sound to good 2012 SOUTHERN RHÔNE ROSÉS has been posted under 2012 SOUTHERN RHÔNE - go to THE LEADING WINES there. A couple of good, enterprising domaines have also been entered: at LIRAC, the very small LE CLOS DES SOURCES, owned by the busy, talented DENIS DAURELLE, who also has a cellar and vineyard equipment company. Under CÔTES DU RHÔNE, MAS POUPÉRAS, a 9.5 hectare domaine in the foothills near VAISON-LA-ROMAINE, where PATRICE CHEVALIER makes a range of wines that taste well and show local character. RECENTLY ENTERED: a visit to the COTEAUX DES BARONNIES vineyards and domaines. This is an underestimated region, the wines also poorly known. Some are very good, some are splendid value. The leading examples are CHARDONNAY and VIOGNIER, both benefitting from being grown at over 500 metres, while the best reds are SYRAH or agile blends of SYARH, MERLOT and a little CABERNET SAUVIGNON. Domaines posted under this IGP VIN DE PAYS zone are DOMAINE DU RIEU FRAIS, DOMAINE LA ROSIÈRE, LE MAS SYLVIA and the CO-OPERATIVE DU NYONSAIS. Log In and read the full report under RECENT TASTINGS. “I bought some hectares in 2012 from Domaine de la Genestière, one of which was this amazing vineyard,” recounted RODOLPHE DE PINS. “An Italian immigrant came to France to work for a family of Saint-Geniès-de-Comolas in 1956, and ended up marrying their daughter. In 1956 the vines were already 80 years old. The name of the vineyard was La Gensatte, perhaps named after a Doctor called Jean Satte, perhaps the man who planted it. There is mention of the plot in documents of 1870, which gives a clue to its great age. In 2012, I harvested 20 hl/ha from its 0.7 hectare.” For the tasting note see CHÂTEAU DE MONTFAUCON under CÔTES DU RHÔNE. ENTERED RECENTLY: in an attempt to unleash les bons temps rouler of hot weather, a full review of 2012 TAVEL ROSÉ has been posted under the sidebar THE LEADING WINES, subtab 2012 SOUTHERN RHÔNE. It is a generally good vintage, although the difference between the best and the worst is wider than it was in 2011. A series of notes on 2012 CÔTES DU RHÔNE WHITES and ROSÉS made by domaines at LIRAC, TAVEL and VACQUEYRAS has also been posted. Look for the LVT (Last Vintage Tasted) tag, either 2012 wh or 2012 rosé. DOMAINE VISITS: a recent domaine, DOMAINE LA BARRIÈRE of PHILIPPE BRUN, listed under CÔTES DU RHÔNE. The main vineyard is north-east of Vaison-la-Romaine, at a little altitude near PUYMÉRAS. Philippe is married to a Taveloise, and also makes a good TAVEL, all 5,000 bottles of it. From VALRÉAS, MAS DE SAINTE CROIX, Belgian-owned, and making authentic reds and a sound Roussanne white. A visit also to one of the leading CÔTES DU RHÔNE estates, CHÂTEAU DE MONTFAUCON, which has raised its top red BARON LOUIS to LIRAC status, and is also now the owner of a fantastic pre-1900 CLAIRETTE BLANCHE vineyard in the good white wine zone of SAINT GENIÈS DE COMOLAS, one of the four communes within the Lirac appellation. ENTERED RECENTLY: VISITS to CÔTE-RÔTIE – notably GUIGAL, including the 2011 LA MOULINE, LA TURQUE and LA LANDONNE in cask, and a range of other wines, with some delicious SAINT-JOSEPH in both red and white form. In similar fashion, a visit to RENÉ ROSTAING, where his very good 2011s were also tasted. UNDERGROUND CONCRETE VAT AT DOMAINE LA MONARDIÈRE, VACQUEYRAS. THE 2 MONARDES IN 2011 IS MADE OF 75% GRENACHE (MID-1950s, 1970) and 25% SYRAH (MID-1980s). IT GIVES UNCOMPLICATED DRINKING, WITH A GENUINE, EASY ROLL OF GRENACHE PLUM FRUIT AT ITS HEART. ENTERED RECENTLY: the main focus is on 2011 GIGONDAS REDS – the report is under 2011 SOUTHERN RHÔNE. If buying, I would go for the easy drinkability of some, and tackle them early in their life. Or I would cellar a select few that can develop over time, and give interest and satisfaction past the 10-year mark. A lot of Notes on 2011 CÔTES DU RHÔNE and VILLAGES have been entered, so a whole range of CO-OPERATIVES and smaller DOMAINES has been added. Here we go: under CÔTES DU RHÔNE: the vast CELLIER DES DAUPHINS at Tulette, LE DEVÈS, the Languedoc-based VIGNOBLES FONCALIEU, the wide range, with some promise, offered by LES VINS PIERRE ROUGON, LA SUZIENNE at SUZE-LA-ROUSSE, TERRES D’AVIGNON, VIGNERONS DE VILLEDIEU-BUISSON. At CAIRANNE, DOMAINE DE LA GAYÈRE. At GIGONDAS, the good new Merchant business MAISON UGHETTO-AUDOIN. At PLAN DE DIEU, the hearty DOMAINE LE GRAND RETOUR. At SÉGURET, MAISON PLANTEVIN, DOMAINE EYGUESTRE. At SIGNARGUES, DOMAINE MAGALANNE. At VALRÉAS, DOMAINE DES GRANDS DEVERS. Early May sees the DECANTER WORLD WINE AWARDS, so there is a lot of tasting to be done in search of quality for that. Perhaps May will bring more sustained heat and growing weather for the vineyards, and for those wanting to drink coolly and outdoors. SANTÉ! ENTERED RECENTLY: a full Report of 2011 WHITE CHÂTEAUNEUF-DU-PAPE, highlighting the role of the CLAIRETTE BLANCHE this year, a variety whose quality is often underestimated. DOMAINE VISITS: at VACQUEYRAS, the DOMAINE LE COUROULU, still a cast-iron STGT domaine, DOMAINE LA GARRIGUE, also traditional, the family BERNARD producing GIGONDAS as well. All their wines are served at their family hotel LES FLORETS, in a magnificent setting under the Dentelles de Montmirail, opened for the season in mid-March 2013. DOMAINE LA MONARDIÈRE, another of the leading names at Vacqueyras, has produced easy drinking 2011, capturing the vintage well. At nearby GIGONDAS, visits to DOMAINE SAINT GAYAN and YVES GRAS’ DOMAINE SANTA DUC have been recorded. Both are on as good form as ever, with a finessing of style chez YVES already noted. The growing merchant range of PIERRE AMADIEU has been tasted - TAVEL and VACQUEYRAS are distinguished there. Also at GIGONDAS, the DOMAINE LES PALLIÈRES, whose fine wines need time, and the sister estate at CHÂTEAUNEUF-DU-PAPE DOMAINE DU VIEUX TÉLÉGRAPHE whose 2010 LA CRAU RED reminds me of the legendary 1978. From CHÂTEAUNEUF-DU-PAPE, LES CAILLOUX of ANDRÉ BRUNEL, and his merchant FÉRAUD-BRUNEL wines have also been reviewed – those made with LAURENCE FÉRAUD of DOMAINE DU PEGAÜ. ANDRÉ has made some very good 2011 RED CÔTES DU RHÔNE from his vineyards in the Gard and the Vaucluse. A domaine where a split has occurred between the two sides of the family is DOMAINE DE L’ARNESQUE, producers of some CHÂTEAUNEUF-DU-PAPE and largely CÔTES DU RHÔNE VILLAGES and CÔTES DU RHÔNE – see the appellation CÔTES DU RHÔNE VILLAGES. 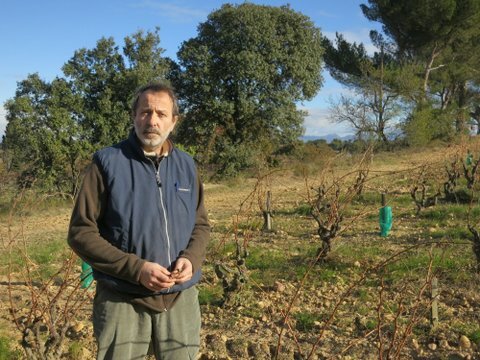 Brother JULIEN BISCARRAT has moved his vineyards to DOMAINE DE CRISTIA of BAPTISTE and DOMINIQUE GRANGEON at CHÂTEAUNEUF-DU-PAPE. ENTERED RECENTLY: a full Report on CHÂTEAUNEUF-DU-PAPE 2011 REDS. See THE LEADING WINES BY VINTAGE tab and its side tab 2011 SOUTHERN RHÔNE. Some Domaine visits, also at CHÂTEAUNEUF-DU-PAPE: the promising DOMAINE DE LA BISCARELLE, the seasoned DOMAINE DE LA VIEILLE JULIENNE, where interesting, more terroir-focused changes have occurred since the 2010 vintage, and the peerless, Ne Plus Ultra CHÂTEAU RAYAS, whose 2011s are astounding. Also, the rock steady CLOS DES PAPES, always much sought after, the authentic DOMAINE LUCIEN BARROT & FILS of RÉGIS BARROT, who now he is past 60, spends half the year living on the beach with his new wife in the Philippines, set to hand on to his niece CHRISTELLE. “Since 2010 I have sought a more systematic, plot-accurate approach,” states JEAN-PAUL DAUMEN as we walk in his vineyard. “I have seven terraces over this 6.5 hectare vineyard, and the bottom four compose my LES TROIS SOURCES red wine. These contain slippage soils off the plateau of MONT REDON, and around the bottom – say on number two here – the soil is sandy." Further up, even by terrace number three, there are some smooth galet stones with a greater brown clay presence in with the sand. The top three terraces, which give the LES HAUTS-LIEUX wine, are more fully clay-limestone with galet stones, and the wine is consequently darker, more backward and more tannic than the more obviously clear-cut, pure, lines of the TROIS SOURCES. A lot of Châteauneuf-du-Pape is overpriced, but at something over €40 at the cellars, these are two serious wines which are less intensively vinified than used to be the case here. “I went too hard on vintages such as 1998,” concedes JEAN-PAUL, adding “in the past ten years, our wines have been more mineral than they used to be.” Hence I recommend the new duo, first made in 2010, as interesting and genuine examples of proper CHÂTEAUNEUF. ENTERED RECENTLY: a series of small Domaines in the right bank GARD département (30), where there are improvements in quality occurring. The left bank Vaucluse (84) has always been more media savvy, and the general quality of winemaking and commitment has been higher across the board for decades. Co-operative standards have also lagged in the Gard. The recent financial squeeze had caused some Co-operatives to fold, others to join together. CHUSCLAN LAUDUN is a good example of the latter, while the CAVE DE ROQUEMAURE, rebranded ROCCA MAURA, is also raising its quality. A sort of third way is for keen, younger Co-operateurs to leave the Co-operative all together, a path already much travelled at CROZES-HERMITAGE in the North, and across the Vaucluse, including VACQUEYRAS. Some leave completely - an example is the CÔTES-DU-RHÔNE DOMAINE DE L'AURE -while others reserve a small part of their crop for home vinification, the bulk of the harvest still sent to the Co-operative. Examples here are the CÔTES-DU-RHÔNE DOMAINE LA ROMANCE and the LIRAC MAS ISABELLE. All three of these Gardois domaines are featured under their respective appellations; all make interesting wines. MAS ISABELLE features in a full article under RECENT TASTINGS. ENTERED RECENTLY: under 2011 NORTHERN RHÔNE, a full report on 2011 CONDRIEU, and 2011 CROZES-HERMITAGE WHITE. More 2011 CHÂTEAUNEUF-DU-PAPE REDS and 2011 GIGONDAS REDS have been logged under their domaines names - look for the LVT 2011 r (Last Vintage Tasted 2011 red) indicator. A visit to the biodynamic VINSOBRES LA PÉQUÉLETTE. ENTERED RECENTLY: Reviews of 2011 RED HERMITAGE and 2011 WHITE HERMITAGE from tasting most of the wines. See LEADING WINES BY VINTAGE, scroll down to 2011 NORTHERN RHÔNE and shift the cursor to the right to LEADING WINES. As usual, PAUL JABOULET AÎNÉ has not been tasted, since they refuse me entry. However, they have changed Importer in Great Britain -Liberty Wines managed only a small handful of years - and have now switched to Bibendum, so I will be attending their tasting in London. DOMAINE VISITS: at HERMITAGE, DOMAINE JEAN-LOUIS CHAVE. The bottled 2009 RED, the bottled CATHELIN 2009 - the first made since 2003, the 2010 WHITE, and the separate site elements of both 2011 RED and WHITE HERMITAGE. Likewise, the excellent SAINT-JOSEPH from their own vineyards. Also, BERNARD FAURIE and MARC SORREL have been visited. They are important, since they add small domaine, high quality location colour to the landscape of HERMITAGE, dominated as it is by the big batallions. At CORNAS, THIÉRRY ALLEMAND, including a look at his 2012s, all fresh and bursting. His neighbours at CORNAS, the highly promising GUILLAUME GILLES and the well-established FRANCK BALTHAZAR and the KING, DOMAINE CLAPE. ALLEZ CORNAS! Our Cheval Mascot CORNAS, by the way, has had lameness in one of his legs, and is Au Repos, resting, for the time being. There have also been many 2011 tasting notes listed under individual domaines at SAINT-JOSEPH and CROZES-HERMITAGE. Use the SEARCH engine - I suggest using 3 stars or more. Over 100 2011 CHÂTEAUNEUF-DU-PAPE REDS have been written up under the individual Domaines. Use the SEARCH engine - I suggest using 3 stars and up as the quality criterion for 2011. Precise details remain obscure, but following the 2012 harvest, brothers JEAN-LUC and JEAN-PAUL JAMET are going their separate ways, the current domaine effectively splitting in two. Always reticent with their words, preferring deeds to marketing, the brothers appear to have decided that Jean-Luc will sell his share of the crop, presumably to the high profile merchants such as Guigal or Chapoutier, for instance, and that Jean-Paul will continue to vinify and bottle as before, from his share of the vineyard. The exact “who gets what” on the vineyard is not clear, even to other vignerons at Ampuis. More details will emerge. From my restaurant review of La Table a few years ago: Franck Gomez is truly what the French term a Vieux Routier. He ran this restaurant with its 8 rooms back in the early 1970s when I was researching my first Rhône book. It was undeniably the most swish and high profile venue in this part of the Vaucluse at the time. It had a Michelin star then, and I recall swanky Swiss and Belgian cars parked outside – not easy, given very little turning space. (My car was a small, neat white NSU 1200TT, capable of 160 km per hour or 100 mph, yes, the ton!! A right little raver, it was, with its engine in the back). Franck died, aged 68, in October 2012, so his early success was indeed precocious – when he started La Table in 1970, he was just 26 years old. As a Maître Cuisinier de France, his table was sauced, as befits a Member of the Gouste Escoffier - more towards Vieille France than nouvelle that was creeping in around the early 1980s. Franck was also involved with Chambers of Commerce and the Avignon hotel school, but his last years were unhappy ones, with his daughter Valérie taking over in some dispute with her father, and standards slipping. But Franck had his époque, and it was indeed a Belle Époque. A wine shop and bar, with the sale of organic wines, Vins Naturels, and books by luminaries such as ALICE FEIRING, this perished in late 2012. The conclusion seems to be that after seven years or so of trading, it remained too eclectic, too “narrow” in these difficult times. Followed by the trade and by some dedicated enthusiasts, there just weren’t enough people to buy the wines given the cost structures of the business. The owner KATE is a most charming person, and has stated that “we are doing what we can to keep something of Green & Blue alive, at least till we find somewhere to go. Click here for details of our Union of Wine offer and if this is something which may be of interest, please let us know as soon as possible. We are also on the hunt for other retail only space, so if you know of anywhere, even if it is on a very short lease, PLEASE get in touch at kate.thal@greenandbluewines.com now. You will have our eternal, undying gratitude.” I wish them well. Gérard was only in his early sixties, taken in the late summer by the dread cancer, which had lingered. He was a community-minded man, with time taken to serve the Séguret appellation as President of that Syndicat, as well as encouraging younger growers and giving advice to them. He was a wise man, unflappable and possessing a wry sense of humour. When I had my 50th birthday party, he and his wife Denise gave me a Jereboam of their Séguret with the message (I translate): Congratulations for this important anniversary. We are convinced that this Séguret will accompany well this memorable evening and will bring you pleasure and longevity. In the pleasure of seeing you again.” I always enjoyed Gérard's wines, made with no fancy oak use, in particular the SÉGURET La Fiole du Chevalier d’Elbene, led by Roussanne and Viognier planted by Gérard in the mid-1990s. As I write, Gérard and Josette Alonso are probably sipping a Manzanilla and enjoying the winter sun of Spain, where they have retired after selling their restaurant in Sorgues. Theirs was a bright late star in the Vauclusien firmament, since they had already achieved success, and worked hard and long, at the Table de Chaintré in the Mâconnais – the same formula as Sorgues, a changing daily menu – based on what the market had to offer - one of regional dishes, an emphasis on fish, and a jolly, long wine list. Gérard cooked, Josette served, and that was that, all done with exemplary smiles and service, no other helpers visible. The good news is that the new owners are also serieux, and accomplished. It is now called LA TABLE DE SORGUES, run by Sandrine and Jean-Paul Lecroq. They have arrived from 17 years at the Château de la Caze at Sainte-Énimie near the Gorges de Tarn in the wild country of the Lozère, South-West France. Review to be posted under Eat and Stay, tel number is +44(0)90 39 11 02, and the restaurant is open lunch and dinner from Tuesday to Saturday. “Tante Françoise” was the suitably eccentric sister of the late JACQUES REYNAUD of Château Rayas, and Emmanuel’s aunt. She was cultured, quirky and kind, a playful smile never far away. Her family always held a summer classical music concert at the Château, with no fanfare and broad publicity – a thoroughly refined, tasteful, old-fashioned event. When harvesting, Françoise would plonk old hats on her head – I once saw her wearing two at the same time, as she huffed and puffed and exhorted the harvesters. In her kitchen hung a calendar that I have sent the family for over 20 years – views of Great Britain, a country that she knew she would never visit. That gave her much pleasure, and was envied by the Château des Tours, Emmanuel, family. The tradition has now passed to them. The arty, non-conformist President of the Cave de Gigondas, Bernard Souchière was a GOOD LAD. His full name was Émile-Bernard, and he was a mixture of poet, prophet and entrepreneur. Ideas made him alive. He succumbed to another dread cancer on 1 August, 2012, aged a young 69 years. He became President of the Cave in 2001, and was the driving force who set up its interesting restaurant in the Village, the Caveau des Gourmets, on the Place opposite the Perrins’ L’Oustalet. In 1969 he established the Atelier des Grames, a publisher, with his partner Anik, and was also an art editor, and the motivator for the sculptures set up around the Hospices de Gigondas above the village. What I call a truly well-educated Frenchman, he was able to discuss philosophy or put current events into a historical, reflective context – not what one finds habitually when standing outside a typical Cave Co-operative. Bernard was also right behind our project for the GIGONDAS Its Wines, its land, Its People book, and submitted old wines and thoughts as I worked away on that. Bernard is a big loss for the Cave, but also for the whole village of Gigondas.